One of the most brutal and destructive terrorist groups worldwide since its emergence in 1980---Peru's "Shining Path" (Sendero Luminoso - SL) ---continues to carry out attacks on Peruvian military, police, and civilian targets in 2008. Almost ten years after the group splintered during a "no-holds barred" offensive by Peruvian security forces, government officials and citizens alike express concern that a return to the past, when almost 70,000 Peruvians and others died, may be in the offing (see Terrorism Focus, September 11, 2007). 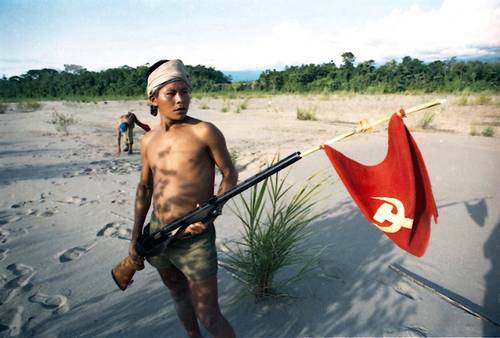 After joining the rolls of the worldwide Leftist-Communist revolutionary movement in 1980, SL proceeded to conduct a campaign against not only the government of Peru, but all elements of Peruvian society in general. An outgrowth of the pre-existing Communist Party of Peru, SL's oft-stated objective was the total reordering of Peruvian society along the lines of the People's Republic of China under Mao Tse Tung. What should be a primary source of concern to a number of neighboring nations, including an incoming U.S. administration, is that SL's apparent resurgence may be viewed fairly as an integral part of a burgeoning wave of leftist ideology in Latin America. Other nations such as Venezuela, Bolivia, and Ecuador, as well as sub-state groups such as Colombia's Revolutionary Armed Forces of Colombia (Fuerzas Armadas Revolucionarias de Colombia - FARC) constitute potential allies in SL's renewed campaign. Peruvian prosecutors are currently involved in seeking a 20-year sentence for the former leader of the Peruvian chapter of the Continental Bolivarian Committee (CCB), which took its inspiration from the "Bolivarian" socialism of Venezuelan president Hugo Chavez (IPS, November 27). Even at present, SL's geographical reach and the military force it commands make it a competing and increasingly threatening "state within a state" in Peru. Concern over an SL comeback is well founded. In the period of time since the end of SL's last, larger and more widespread terrorist campaign in 1999, the group has added another "weapon" of sorts to its already formidable arsenal: abundant revenues derived from the trafficking of cocaine. In neighboring Colombia, FARC has also been nurtured handsomely by the trafficking of cocaine. FARC, a self-professed Marxist-Leninist group, has grown since its birth in the 1960s from a guerrilla band into a multi-billion-dollar international enterprise, with perhaps as many as 18,000 guerrillas under its command. Initially, FARC, like the Shining Path, was treated as merely another of the numerous Latin American guerrilla groups extant at the time. Now, of course, FARC maintains a presence in perhaps as much as 20 percent of Colombia and, although estimates vary, generates annual revenues estimated at over a quarter of a billion dollars as a result of having reinvented itself through its criminal activities. Unless contested vigorously and successfully by the Government of Peru, the geography and climate of Peru, very favorable for the growing of coca plants, holds promise for the same kind of growth of SL military power. The Shining Path leadership has been under constant pressure from Peru's security services over the last year. A leader from the top tier of SL, Epifanio Espiritu Acosta (alias JL), was killed by Peruvian authorities on November 27, 2007, during an operation in which eight other SL guerrillas were captured (LivingInPeru.com, March 19). Following that incident, Peruvian officials announced on March 18 (LivingInPeru.com, March 19) that Felix Mejia Asencio (a.k.a. Comrade Mono), another of the top leaders of SL, was captured. Asencio headed one of the two SL columns, the Comite Regional del Huallaga (CRH), and was closely associated with "Comrade Artemio" (Filomeno Cerrón), the current leader of the SL insurgency. Comrade Artemio is the sole top-level SL leader who has not yet been killed or captured. Peruvian security forces have been on the offensive against the Shining Path since last August, focusing their activities on the jungle-covered VRAE (Valley of the Rivers Apurimac and Ene) region, a prime coca producing region close to the original home of the Shining Path movement. Though government sources have estimated only 150 SL fighters remain in the bush, this small force still continues to mount deadly attacks on Peruvian security forces. In what was described by Peruvian Government sources as the bloodiest SL attack in ten years, Shining Path guerrillas killed approximately 14 Peruvian soldiers and perhaps as many as seven civilians in a carefully planned ambush of a counter-terrorism patrol in Peru's Huancavelica province on October 9 (AFP, October 10). The Shining Path announced the attack was intended to celebrate the 80th anniversary of the founding of the Peruvian Communist Party (EFE, November 19). Ominously, an October 22 report stated that SL members had stolen dynamite from the mining camp of the US-based firm Doe Run, likely presaging the form of future attacks by SL in the area. Indicative of the isolated character of the area and the nature of SL's existing and planned activities, the guerrillas also took medical supplies, food and radios (Reuters, October 22). November marked yet another upsurge in SL attacks. On November 12, two Peruvian soldiers were wounded when gunmen believed to be SL fighters targeted a helicopter responding to an earlier attack that wounded two other Peruvian soldiers (Latin American Herald Tribune, November 15). Another ambush in the Huallaga Valley on November 27 killed five police officers, including two members of the Special Operations unit. At least 40 guerrillas using hand grenades, shotguns and automatic weapons were involved in the attack (Peruvian Times, November 28). The ambush was remarkably similar to one carried out in nearly the same place in 2005 by 30 guerrillas under the command of "Comrade Artemio." The latest attack came days after a sweep of the Huallaga Valley by security agents of the "Huallaga Front" failed to locate the SL commander but did find correspondence indicating Artemio was in touch with imprisoned SL leader Abimael Guzmán Reynoso. Besides Artemio's personal belongings, security forces recovered explosives, detonators and green military uniforms bearing the hammer and sickle (Elcomercio.com.pe, November 17; EFE, November 17). Over 60 people have been killed in ambushes on roads in the region since 2001, with the annual rate on the increase (Con Nuestro Peru, November 29). Reflecting the group's long-term ambitions, the Shining Path is reported by Peruvian Police sources to have been planning attacks in Peru's capital, Lima, during the recently concluded summit of the Asia-Pacific Economic Cooperation summit meeting. The APEC Summit meeting, in what must have been a very inviting terrorist target, brought together the heads of state of 21 nations, including U.S. President George Bush and Russian President Dmitri Medvedev. Actual SL documents captured from one of the group's camps, and reportedly authored by Shining Path leader "Artemio," characterized the APEC Summit meeting as being attractive to the group because of the media coverage that an attack would garner (Peru.com, November 18). It is the Peruvian peasantry that finds itself caught in the middle of the conflict between guerrillas and responding police and military units (ipsnews.net, November 6). There are concerns in the Peruvian government that many of these people may begin evacuating the Huallaga region to avoid a resurgence of the brutal warfare that characterized the area in the 1980s and 1990s, when more than 70,000 Peruvians were killed. President Alberto Fujimori's "dirty war" effectively destroyed the SL, leaving only several hundred fighters left in the bush. Despite a widespread impression the movement was finished, the Shining Path's transformation into a group providing security for narcotics traffickers while pursuing its goal of a Maoist state seems to have refueled the conflict.